A commercial roof can call for a number of different commercial roofing services as the years go on. If you’re in Grand Haven, MI, Empire Contractors has you covered with everything from small roof repairs to complete roof replacements. You can reach us at (231) 578-4760 for a no-obligation estimate on your roof. At Empire Contractors, we take roof inspections seriously. It’s extremely important to take a thorough overview of a roof before working on it. Our gifted roofing professionals will be able to get more years out of your roof by inspecting it thoroughly to stay on top of any important repairs, maintenance, and other fundamental services. If your roof is leaking or has some other type of issue, why wait? The roofing specialists at Empire Contractors can be over quickly to assist you. We make sure that we take of all of your roof’s problems when we come to repair it. Our professionally-trained craftsmen are all fully licensed and insured. Prior to hiring a roofing contractor to replace your roof, it’s probably in your best interests to explore potential alternatives. Very few companies around can even begin to compete with our level of experience and expertise in roof restoration. It’s very likely that we can squeeze 10+ more watertight years out of your roof with a roof coating. We probably don’t have to tell you how much money this would save you in the long run. 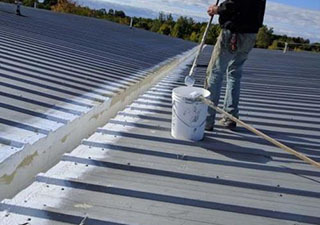 At Empire Contractors, we have experience replacing a wide range of commercial roofs. We’ll be happy to give you a free quote on a new roof for you to think over. When it’s time to get a new roof, it’s crucial to hire a reputable company like Empire Contractors. We’ll make sure to install your new roof perfectly so that it will hold up for decades. 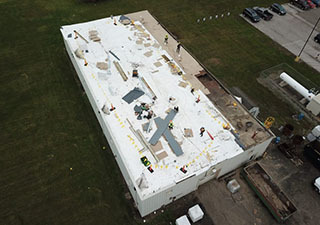 Empire Contractors is the go-to commercial roofing company for people in Grand Haven, MI. With low prices, experienced roofers, and phenomenal customer support, we’re easily the top choice around. You can learn more about our commercial roofing services by giving us a call today at (231) 578-4760.